Strengthens cardiovascular system, tones and strengthens muscles, burns fat, increases bone density and connective tissue resilience. Not only do you get in good shape but you develop functional self-defense qualities at the same time. By repeatedly striking the bag, you activate all of the major muscle groups in your body. The arms, shoulders, waist, and leg muscles must be coordinated and conditioned. This training also builds athletic qualities such as speed, power, balance, timing, and coordination. Physical action is required to flush this residue out of our bodies before it compromises our health and immune system. 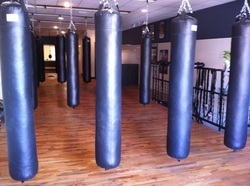 Heavy bag work is an excellent way to manage stress, while it satisfies the body’s inherent need to fight.